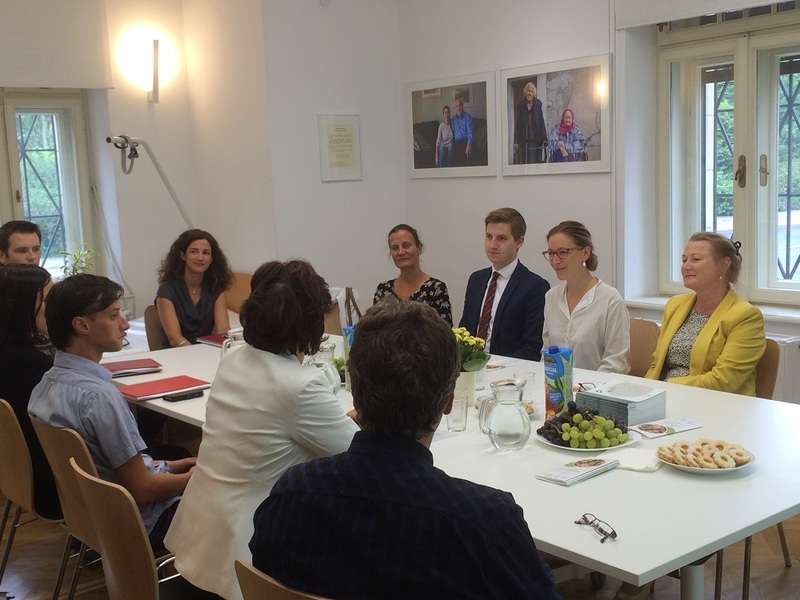 Ljubljana, 2 September 2015 – The Ambassador of the Kingdom of Norway, responsible for Slovenia H. E. Tove Skarstein visited Slovenia and met with the representatives of the Government Office for Development and European Cohesion Policy. They discussed implementation of the Norwegian Financial Mechanism and the EEA Financial Mechanism in Slovenia. The Ambassador visited two projects, namely the project “Parenthood trainings to prevent behavioural problems of children – mental health for every child” which received a grant under the Norwegian Financial Mechanism in the amount of almost EUR 550,000, and the project “Active and high-quality ageing in home environments” which received a grant under the Norwegian Financial Mechanism in the amount of over EUR 700,000. The project “Parenthood trainings to prevent behavioural problems of children – mental health for every child” deals with behavioural problems which are the most frequent reason for children being treated by professional services in the field of mental health. Behavioural problems represent a long-term financial burden and are prevented by implementing programmes for parents while they still have some influence on their children. The project, which has a shorter name “AMAZING YEARS FOR EVERY CHILD”, will introduce an efficient preventive programme which will aim to improve services in the field of mental health of children. The programme will be similar to the Norwegian programme and other programmes introduced in other countries. The project, which is implemented by the Division of Paediatrics of the University Medical Centre Ljubljana, strives to introduce a programme to prevent behavioural problems of children, to train 20 experts who will implement the programme in 10 centres and 5 regions, to include at least 300 parents in the pilot programme, and to develop guidelines on how to reorganise the services dealing with behavioural problems of children. The aim of the project “Active and high-quality ageing in home environments” is to introduce a system-wide change at the local and national level which would result in the adoption of a specific law governing long-term healthcare in the framework of the wider public healthcare service network. Healthcare would be provided at the homes of users eligible to such assistance. As a result of a higher standard of living, access to better-quality food, better healthcare and the ageing of the “baby boom” population, the percentage of older population increases each year in Slovenia as well as throughout Europe. According to statistics 32% of Slovenia’s population will be older than 60 years by 2030. System-wide solutions should include all aspects, in particular the aspect of healthcare and the social and economic aspect. Practice has shown that the users of home care services also want to use other services with the highest demand for physiotherapy, occupational therapy, speech therapy, dietary and health care. All these services will be implemented in the framework of the project along with mass measurements of individuals older than 65 and intervention proposals on how to adapt their living environment.